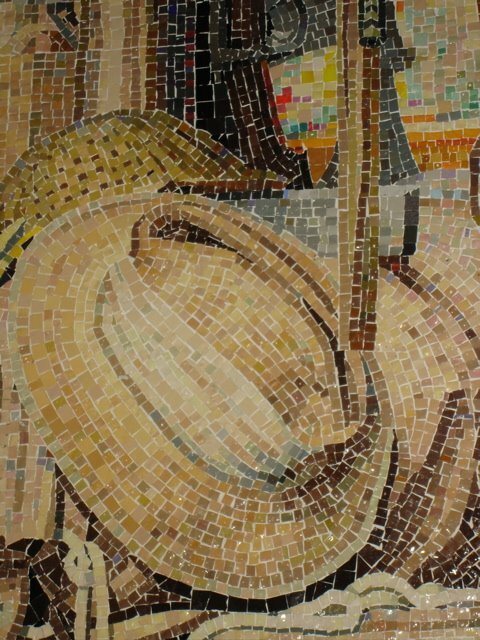 A little while ago I decided to photograph the mosaic in my hometown of Canberra, Australia and showcase them on this blog. We seem to be fairly appreciative of this medium as it is certainly around. Probably the most impressive mosaic and certainly the place to start for this ongoing collection is inside the War Memorial, one of my favourite buildings in Canberra and it being a very good example of an art deco building. 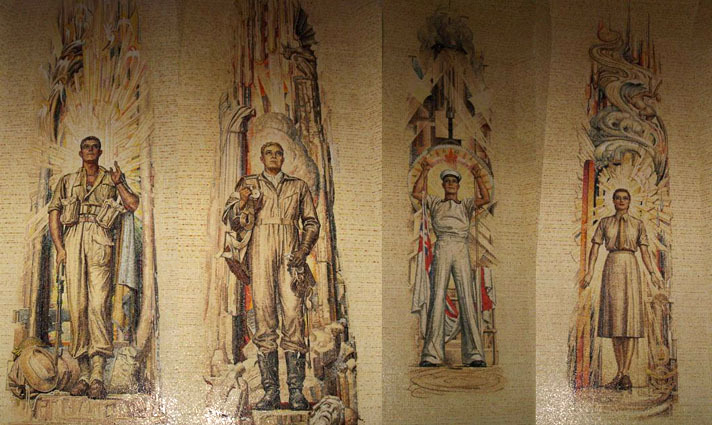 The interior of the Hall of Memory is covered with mosaic, top to bottom. There is not an inch that has not been mosaiced. I was really very moved by it, and certainly put in my place! There are over six million pieces of tesserae, and around 80 different colours, all smalti. The murals were designed by an Australian artist (also a mosaic artist) called Napier Waller who also fought in WWI. I believe the art was in commemoration to those who fought in that war and subsequently also in WWII. As you can see all the figures are dressed in WWII uniforms. I think what really moved me so much was the fact that war widows actually pieced all this together down in Victoria (using the reverse method). 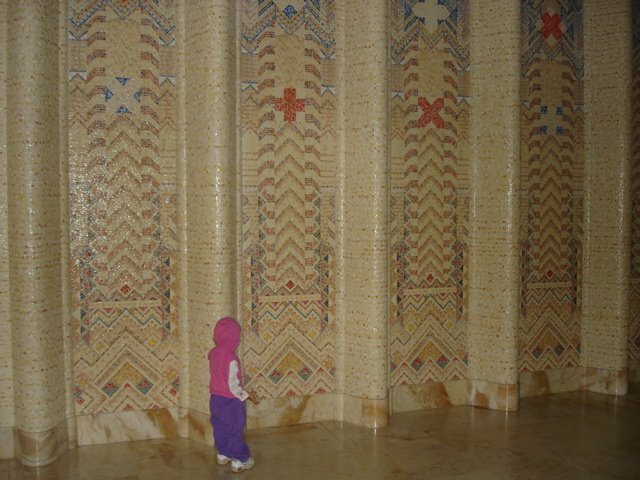 They were under the direction of Waller and there were apparently several Italian mosaic artists who installed it. It’s an amazing feat really. The whole installation was finished in 1958. There are 2 mythical creatures depicted above two of the murals. One of which is a sea centaur, representing an hospital ship named AHS Centaur that was sunk by a Japanese torpedo up near Brisbane, many Australian lives lost. The other being a gargoyle, with a sardonic smile, watching the mass devastation of all things (particualrly buildings) old and historical. 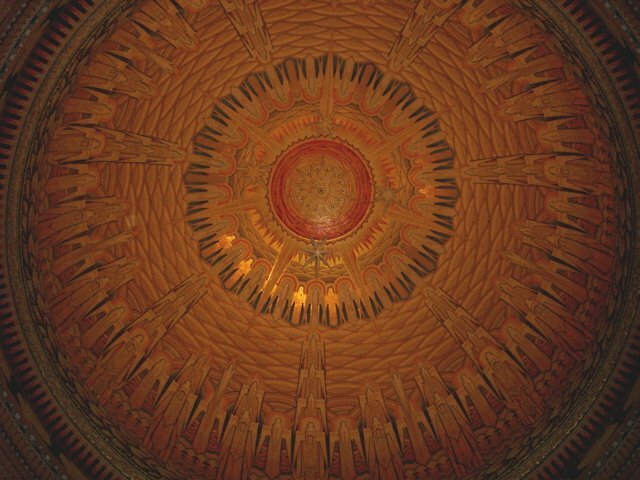 The idea behind the Dome was really interesting. It is divided into seven segments, representing Australia’s seven pointed star. You can’t see it in this picture but there are hands reaching up symbolising the earth giving up the spirits of those who lost their lives to “heaven” depicted by the sun, the symbol of eternal life. There are also pictures of black swans who always come home to die. Everything tied in, and there’s so much thought behind it all. It’s really very beautiful. Needless to say, it’s beautiful and well worth the visit for some amazing art and architecture, and of course the history and memory of all Australian soldiers and peacekeepers.